I don’t usually rush to a new restaurant the moment it opens. I have only a limited interest in the latest new hotspot. But, coincidentally, a few weeks ago at dinner with friends, we spoke about Skye Gyngell; about her cookbooks, about her previous restaurant, Petersham Nurseries, which I didn’t have the opportunity to visit while she was the chef. As the conversation migrated to her upcoming venture, in Somerset House, opening a few weeks hence, we were all excited to go. I had not been to Somerset House since we moved to London last year, which means the last time I was there was to visit the Courtauld Gallery during a solo visit to London in my teens. That moment is my favorite memory of the trip, so stepping through the majestic building again rang of the past in a lovely, personal way. It was a good idea to meet before dinner for a glass of wine outside in the courtyard to savor the setting. I own two of Skye Gyngell’s cookbooks and often leaf through them. I am invariably transported, intrigued and tempted, though I have only made very few of the dishes. Perhaps I am disconcerted by the idiosyncratic ingredients — one foot firmly settled in Italy while the other perambulates confidently through Asia — which make it hard for me to imagine the finished dish, to know where I am going. This should be thrilling; perhaps I play it a little safe in my own cooking. When I eat out, however, being surprised is exactly what I crave. My first impression was to be disappointed by the familiarity of the menu. I was hoping for the spirited flavor combinations I have so long admired — and shyed away from — in the books. And so? The starter was one of the best things I have eaten recently. I am still unsure how the combination of ‘Puntarelle and goat’s curd with mint and black olive dressing’ worked so well, but it was fresh, balanced and addictive in the most convincing way. I could happily have had just that all evening. Next, Slow cooked pork shoulder with girolles, daterrini, and polenta was predictable and a little disappointing, with nothing to elevate the flavors, no special zing. We shared desserts and I happily relinquished any claim to either the warm chocolate cake (you know me) or even Buttermilk pannacotta with damsons and wood sorrel, for yet another lunge at the Hazelnut and pear tart with creme fraiche and espresso — heaven. 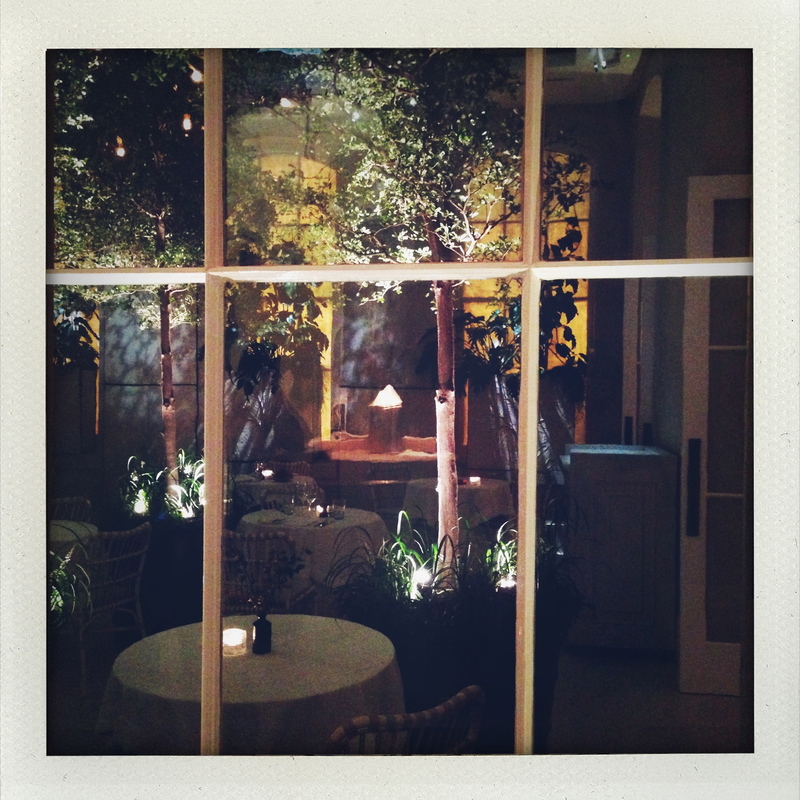 The winter garden (pictured above), for smaller parties, holds most of the magic of the place. The main dining room is tall, light, feminine, and ultimately a bit bland. It reminded me vaguely of ABC Kitchen in New York, but lacking the lightness and playfulness which give that restaurant its irresistible charm. I don’t love the space. Which brings me to the ultimate question: all things considered, am I impatient to go back? 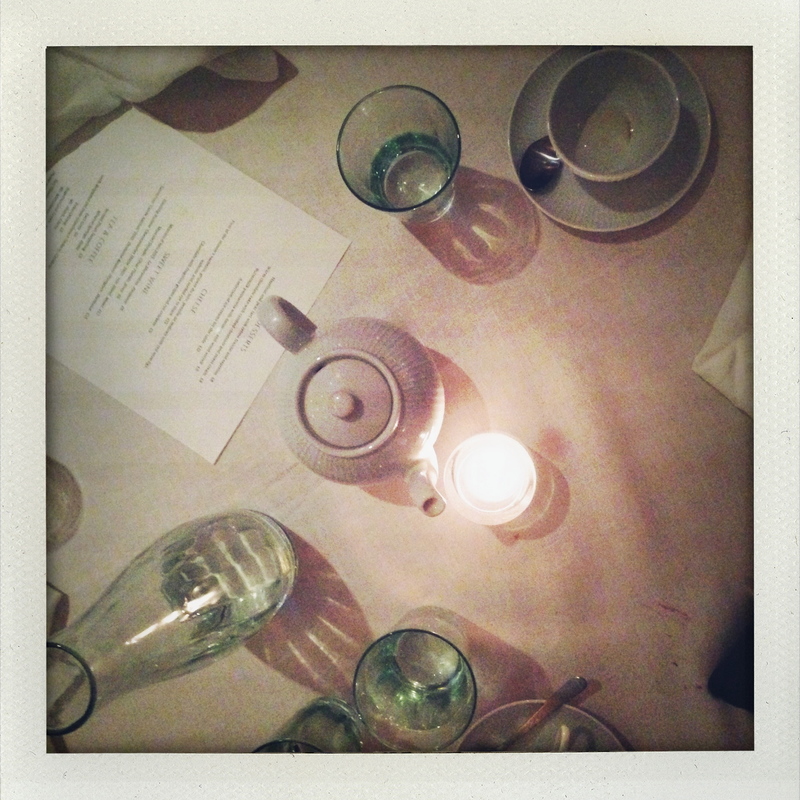 Unfortunately I must admit, despite some stunning dishes and, that evening, great company and a lovely night, not very. I realize it’s early days and one shouldn’t judge a restaurant on just one meal. But the place is a little too grand, the food not quite surprising enough — they seem out of sync. I imagine this meal in the lovely rickety setting of Petersham and can’t help but wish I hadn’t missed that. Luckily, I have the cookbooks, which I am now emboldened to try! This entry was posted on 17 October 2014 at 08:06 and is filed under Restaurants. You can follow any responses to this entry through the RSS 2.0 feed. You can leave a response, or trackback from your own site. Ah, a bit of synchronicity. After leafing through them many times (in Britain and in the U.S.), I finally bought one of her cookbooks yesterday (the year in her kitchen one) at a discount bookstore. Reading through it last night, I saw many things that looked quite interesting, but only one or two recipes that I thought I might actually make. You’re so right, though: It’s not quite fair to make a final decision when a place has just opened. In a year or so, it might be your favorite place. That’s so interesting to hear! The restaurant is probably a bit too self-conscious to become a favorite, but I will definitely give it a second chance. And I’d love to hear about the recipes you make from Skye Gyngell’s book!